Hello Wednesday. 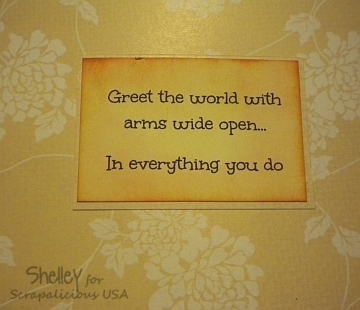 Welcome to the Scrapalicious Blog Challenge. This weeks offering is all about "smiles". 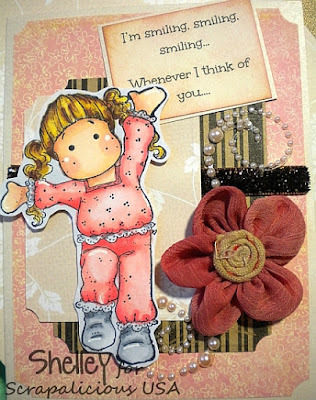 To join our challenge pop on over to the blog and submit your cards or projects that have a smile or contain the word "smile" as a sentiment. Pretty simple, wouldn't you agree? The verse was actually written by my ever creative hubby. He is so good at putting words together that work just for what I was actually thinking. Of course, how can you go wrong for inspiration when there is such an adorable image to add on the card? I do love those Magnolia Stamps. Isn't it a little ironic though that they have no mouths for smiling? I am actually going to send this card out as a graduation card for my niece. I do not believe she is a reader of my blog, so feel fairly sure she will still be surprised when she gets the card. Please come join us on this challenge. If you need some more inspiration, you can check out the low, low prices on scrapbook supplies now at Scrapalicious USA. Cindy has so many items to choose from and many you may have never seen before. Many of her items are harder to find and original enough they will make your projects one of kind.